Look at the picture above and take a moment to think which one of them is a bouba and which one is kiki. It’s very likely we selected the same shapes for both bouba and kiki, so did 95 to 98% of the people who came here to see this. 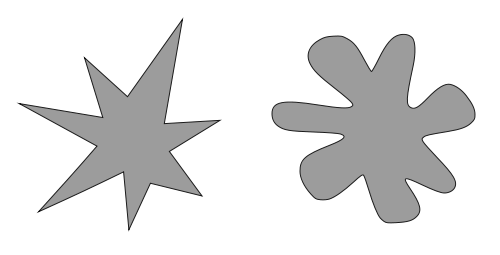 Scientists call this the bouba/kiki effect – a non-arbitrary mapping between speech sounds and the visual shape of objects. Even if the sounds bouba and kiki mean nothing at all, people from all over the world, or from countries speaking varied languages, select the same shapes more than 95% of the time. Irrespective of the languages they spoke, the human brain somehow attached abstract meanings to the shapes and sounds in a consistent way. Children as young as 2.5 years start doing this. The rounded shape may most commonly be named “bouba” because the mouth makes a more rounded shape to produce that sound while a more taut, angular mouth shape is needed to make the sound “kiki”. The sounds of a K are harder and more forceful than those of a B, as well. Just like for bouba and kiki, there is a strong preference to pair the jagged shape with “takete” and the rounded shape with “baluba”.